It’s a day late but nowhere near a dollar short (except, I guess, in terms of what I’m paid for these shows; in that case it’s several thousand behind: Ho Chi Minh’s entrance into our story. Titles are self-explanatory, really, but I hate the way that two videos or images look when they’re smushed together. And this last one is a little later than our current show, but it’s another, more countrywide vision of (nearly) contemporary Vietnam, so it’s more than worth a glance. A couple of notes in the middle here, to seriously bury any really pertinent information in these notes. I’ve laid hands on a few more books than I had when I began this whole Vietnam venture. The first of those is Embers of War, a book by a Cornell professor that explicitly sets out to fill the hole in American Vietnam scholarship where the French colony and their war of reconquest should be. I’ve got another one (courtesy of my folks, who brought it down here to Mexico) from Bernard Fall that I’ve been wanting for quite a while, which is his least narrative, most thorough analysis of both the country and people of Vietnam (or, as he maintains it ought to be, and he’s probably right, Viet-Nam). There’s so much new and pertinent information in this one that I’m going to end up doing a second geography run-through once we get to the French war just to get it all in. Then we’ve got the maps. This is your real basic relief map. The thing that I like about it, given that it’s modern, is that, as far as I can tell, the major roads it includes are somewhat like the road network that grew up from the end of the imperial period through the French colony and the war. Somewhat. 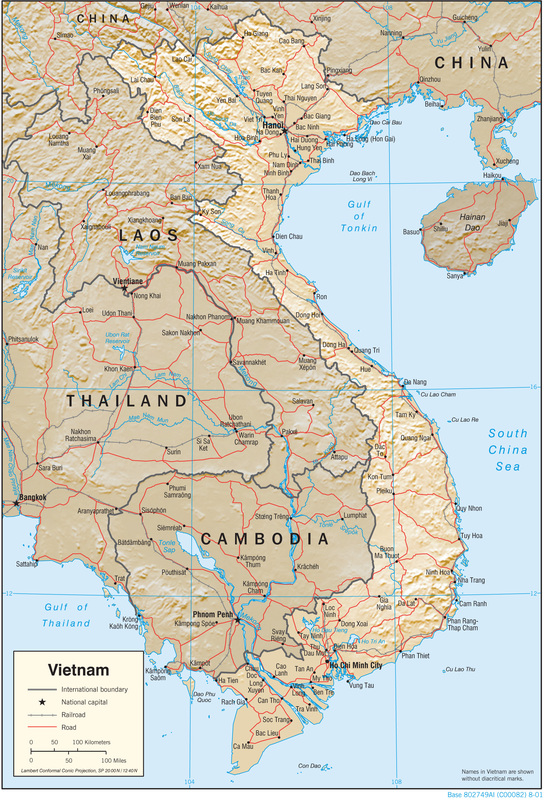 And here we’ve got a vintage French colonial map of Indochina, and you can see how they bundled Cambodia and Laos up with Vietnam, as well as the way they split Vietnam up into three distinct (and separately administered) regions: Tonkin up north, Annam in the middle, and Cochinchina in the south. Chinese Evacuation (1937). British Pathé. YouTube. Embers of War: The Fall of an Empire and the Making of America’s Vietnam (panel with Frederick Logevall). The Woodrow Wilson Center for Foreign Policy. YouTube. Well, here we are folks. The beginning of the Vietnam series and very probably the end of SFD. We’re starting, literally, with the dawn of human history and carrying it all the way up to the 1700s. Like the folks over at Blank Check, we’re connoisseurs of context, and to get Vietnam right in a way that the Americans didn’t from 1946 to 1975, and in a way that even Ken Burns failed to get it in 2017, we’ve got to go way back. It’s going to be a little tougher to get photos for this one, given that our big timeline begins around 2000 BC and gets more concrete around 221 BC, but let me try. First, though, if you want to get a visual for the cold open, there’s this. You can just make him out there behind the microphone on the right, but that’s Ho Chi Minh on September 2, 1945, officially declaring Vietnamese independence. We’ll get more into this in the next show, but there were Americans in Ho’s audience, Americans that had helped him to fight against the Japanese, and, implicitly, against French designs on his country. Here we’ve got a temple statue of a Hung King, one of the pseudo-mythical line of kings that ruled the Vietnamese from the time they came down from the highlands to settle the paddy land of Tonkin around 3,000 years ago until 221 BC. This is Zhao Tuo or Trieu Da, an officer of one of the southern Chinese kingdoms annexed by Shi Huang Di. He joined up, became a general, and took most of northern modern Vietnam. When the Qin dynasty, and the empire Shi Huang Di had built, collapsed, Zhao Tuo declared himself king (and then emperor) of Nanyue or Nam Viet, comprising parts of southern China and northern Vietnam. Chinese reconquest followed, and Vietnamese independence after that. Just like in the episode, though, we’re going to skip most of the intervening years because they’re not entirely relevant to us. By the eighteenth century, though, Vietnam was split between two powerful families, the Trinh in the north and the Nguyen in the south, with the Le Emperors nothing more than captive figureheads in the court at Hanoi. Rebels from Tay Son village in Annam, fed up with the corruption of the Nguyen and the costs of their wars against the Trinh, Siam, and Cambodia, rose up to challenge the status quo. They wrecked the Nguyen, killing nearly all of the family, and then marched north and destroyed the Trinh. The last Le Emperor escaped to China and sought help from his imperial counterpart. That army of 200,000 the Tay Son also crushed. While all this was going on, though, the last surviving Nguyen scion, Nguyen Anh, had escaped to Siam, modern Thailand. Just before his flight, Nguyen Anh met one Pigneau de Behaine, a French Catholic priest living in Vietnam. Behaine was looking for a way to secure a legal position for Vietnamese Catholics, and backing a contender for the throne seemed like a pretty good move. Behaine sought help from his own monarch, Louis the XVI. Louis signed the Little Treaty of Versailles, promising military aid in exchange for Catholic concessions, but the Revolution and his subsequent unheaddening (along with the opposition of the Irish, sort-of-also-American governor of French Pondicherry in India, Thomas Conway) torpedoed that plan. Behaine raised his own money, munitions, and mercenaries in Paris by appealing to sympathy for embattled Vietnamese Catholics, and sailed back to Nguyen Anh. Because of a confluence of factors (somewhat covered in the show), Nguyen Anh was in the process of taking the country back from the Tay Son, a conquest he completed in 1802. Behaine didn’t live to see it though, having died in the defense of a fortress, like any normal missionary Catholic priest. Nguyen Anh renamed himself Gia Long and founded the Nguyen Dynasty, which would last right up until the death of Vietnamese Imperialism in 1945. The country was re-united for the first time in over a century, and the new emperor’s rule was long and just. Unfortunately, it also ended just a few short years before the French arrived in force, holding rifles this time, not crosses nor bibles.